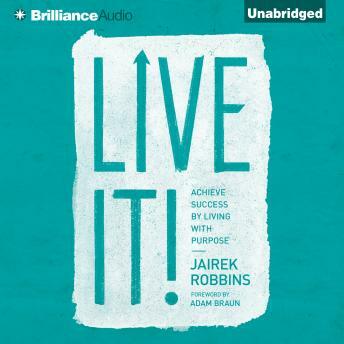 Jairek Robbins, decorated performance coach and lifestyle entrepreneur, guides you through his proven, step-by-step process for filling the gap between where you are today and where you want to be. In reassuring and easy-to-understand language, Robbins helps you build a strong foundation for authentic happiness. Each chapter is strategically designed to engage you with personal reflections and challenges that will encourage you to make immediate improvements to your everyday behavior. Robbins’s uplifting method will give you the tools you need to avoid the distractions in your life and concentrate on the areas that deserve the biggest focus, including health, family, intimate relationships, your professional life, and spirituality. Robbins leads you toward a life of growth and contribution that will enable you to become the happiest, healthiest, and most fulfilled version of yourself—and inspire you to help others do the same.